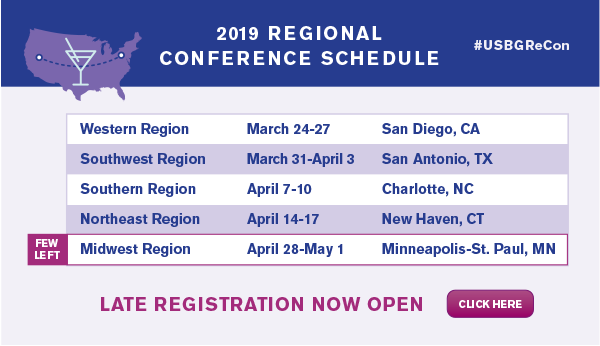 2019 Regional Conference - Registration Open! Regional Conferences provide valuable training and a plethora of networking and social opportunities to meet other members! Chapter Governance… And much, much more! Agendas for all conferences will be available at least one month in advance, so check back often! WEDNESDAY Chapter Leadership (all members welcome), Fun Day coordinated by host chapter (Optional), and live MA Testing (Optional) for those who registered by March 1st! All prices include meals, seminars, evening activities, and three (3) nights in host hotel. FIVE (5) FREE CONFERENCE PASSES ANNOUNCED: Thank you to all members who participated in National Board of Directors election... By doing so, you were entered into a drawing for a chance to win a pass to one of this year’s Regional Conferences. A big congratulations to the five 2019 Regional Conference Pass Drawing Winners! We hope to see you at this year's regional conferences. Last year, these conferences sold out! Don’t miss your chance this year to experience making new connections, camaraderie and community! Reserve your spot... Space will be LIMITED! Comment below with any questions you may have -- And check out the Regional Conference Community Page for updates!